Normally I don’t scan comics. I think a person should be buying comics to support the artists… But I gotta say this was free so I would think no harm no foul. 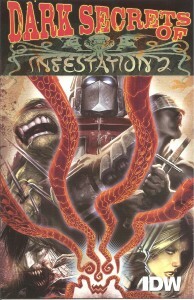 It is the ashcan promoting the upcoming Infestation 2 event over at IDW. So feel free to grab the PDF or CBR download below! Of course if you want a physical copy head on down to your local comic shop and see if they have one. They are free!